Please join your fellow members at CPS Distributors for the first BBQ of the season! Along with the great fellowship you'll get to see some of the latest innovations in green industry equipment, supplies and technology. Come explore their 45,000 square feet of office and warehouse space and a 2.5 acre storage yard on the 8 acre site. CPS is a leading distributor for all things irrigation including pumps, sprinklers, water features, control systems and much more. 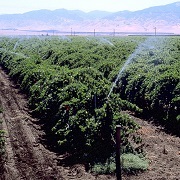 look at what's new in horticulture irrigation technology.